Giveaway alert! Win a $25 gift certificate from Sprout Baby AND get a coupon code for 15% off your first purchase at Sprout Baby AND a chance to win $2500 in cash! Details at the bottom of this post. Eco-ngratulations Nancy! All of my readers can save on purchases at Sprout Baby and save 15% off your first order with coupon code SBBL055!! No, baby food does not have to be boring? And it doesn’t have to come in a glass jar! If you have shopped the aisles of the local grocery stores lately you might have noticed that the baby food has been invaded by celebrity chef Tyler Florence. 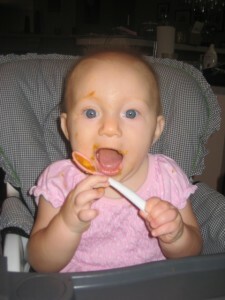 His gourmet organic baby food line, Sprout Foods, is spoiling babies all around the country! Babies just like Lil’ B are loving the new flavors such as Peach Rice Pudding and Oatmeal with Roasted Cinnamon Applesauce. Sprout Foods uses all USDA certified organic ingredients with no preservatives, sugars, or fillers. Their resealable pouches are BPA-free and leave a smaller footprint on the Earth than the traditional glass jars. We received a variety pack of Sprout Food for Lil’ B to try and I have to tell you…the smell of the Peach Rice Pudding made me hungry! I actually tried it and it’s REAL FOOD…not just baby mush in a jar! Trust me…and Lil’ B…your baby will L-O-V-E Sprout Foods! While I make most of Lil’ Bs food from fresh fruits and vegetables there are times when processed baby food is just more convenient (like when you’re traveling or visiting a theme park). It’s nice to know there is a baby food out there that resembles homemade! Sprout Baby is a sister company of Sprout Foods and they are working to provide parents with environmentally friendly baby products such as glass bottles and cloth diapers. Another one of their partners is Healthy Child Healthy World which is a non-profit organization working to provide parents with steps to creating a safe, clean and green world for their children. Sprout Baby is celebrating their 1st birthday! And they want to giveaway $2500 in cash! Yes, for all customers who shop between now and Dec 15, 2009, we will be entered into a drawing for $2500 in cash! One lucky reader will receive a $25 gift certificate to spend at the Sprout Baby store online to purchase anything you like! They sell Sprout Foods, cloth diapers (I can hear my readers yelling with excitement!!! ), feeding items for baby, soothing items for momma, and so much more! WIN IT! Want to win the $25 gift certificate to Sprout Baby? All you have to do is visit Sprout Baby online and tell me what you would buy if you won. Leave me a comment below and be sure to leave your email address so you can be contacted when you win. Giveaway is open to resident of the US only. 1. Make a purchase at Sprout Baby using coupon code SBBL055 and earn 5 bonus entries into the giveaway. Leave a comment below telling me what you purchased and the date. 2. Follow @sproutbabyclub on Twitter for 1 bonus entry. Leave me a comment. 3. Follow @theecochic on Twitter and tweet about this giveaway (max 5 bonus entries). Leave me a comment. 4. Become a fan of SproutBaby.comon Facebook for 1 bonus entry. Leave me a comment. 5. Subscribe to my blog in your favorite readers for 1 bonus entry. Leave me a comment. LEAVE YOUR COMMENTS HERE TO ENTER! Contest will end on Friday, November 13th, 2009 at midnight (EST). Yes, I was provided with samples from Sprout Baby to write this post…but as you can tell my the picture of Lil’ B…she really did L-O-V-E the food! I would buy the hemp fitted diaper.